Smallsats are now a major focus for Harris. Photo shows HSAT, the company's first ever smallsat, launched late last year. Credit: Harris. 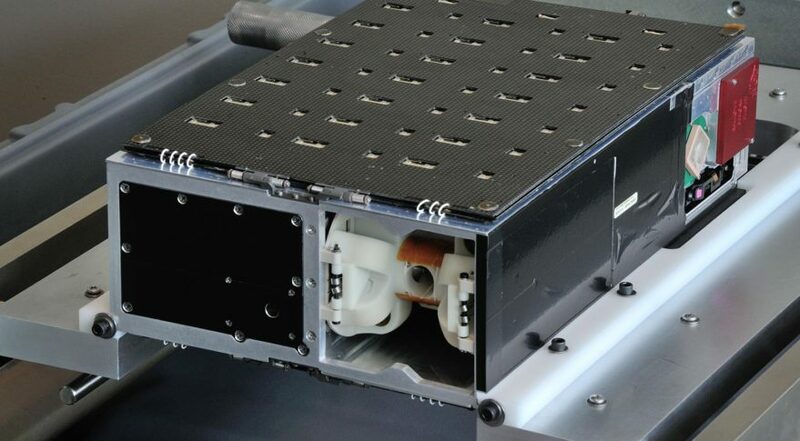 WASHINGTON — Harris Corp. and L3 Technologies reported contrasting financial performances for their space activities Jan. 29, with Harris charting growth in classified smallsat programs and L3 recording losses in satellite communications components. Chief executives from both companies said their $34 billion merger, announced in October, remains on track for completion by mid-2019 despite the five-week partial government shutdown that delayed regulatory procedures. The shutdown ended Jan. 25 after U.S. President Donald Trump signed a continuing resolution that funds the government until Feb. 15. Neither Harris nor L3 group all of their space activities under one division. Nonetheless, space activities boosted Harris revenues in its Communications Systems and Space & Intelligence Systems divisions. L3, in contrast, saw a boost in space sensors activity for its Intelligence, Surveillance and Reconnaissance Systems division, but a slowdown in traveling wave tube amplifiers it builds for communications satellites. New York-based L3 Technologies’ Communications and Networked Systems division, which builds traveling wave tube amplifiers, generated $816 million in net sales for the quarter ended Dec. 31, a three percent decrease compared to the same quarter last year. The division’s performance kept L3’s operating margin flat compared to 2017 despite double-digit growth in net sales for the company’s two other business areas: Intelligence, Surveillance and Reconnaissance Systems, up 14 percent to $1.22 billion; and Electronic Systems, up 11 percent to $735 million. In an earnings call, L3 CEO Christopher Kubasik, said misread commercial space demand, self-inflicted supply chain issues, and lost talent resulting from factory consolidation rocked the company’s traveling wave tube business. “It was pretty much a perfect storm as to all of the things that could have gone wrong,” he said. An L3 data system also failed to provide notice of when materials for the amplifiers were needed, resulting in production delays, he said. L3 had been consolidating facilities before announcing the Harris merger, and plans to continue reducing its floor space when the companies are combined. Shifting the traveling wave tube business was a difficult start to that reduction, Kubasik said. Traveling wave tube amplifiers are difficult to produce and have hamstrung satellite programs in the past. Kubasik said production is being watched closely, and that noticeable improvement began this month. Melbourne, Florida-based Harris Corp., in contrast, reported an 11 percent increase in Space and Intelligence Systems revenue to $513 million, driven largely by military and civil space programs. Harris CEO William Brown, speaking in an earnings call earlier in the day, highlighted classified smallsat programs with “multiple customers” across the defense department and intelligence community as driving significant space growth. “In our small satellite franchise, we’ve received awards of over $350 million over the past three years to develop and produce 17 satellites with five different customers, as we move from pathfinder missions to building a full constellation in space,” he said. HSAT, Harris’ first smallsat, launched Nov. 29 aboard an Indian Polar Satellite Launch Vehicle, demonstrating the company’s ability to expand from components and hosted payloads to entire satellites. Brown said two other classified Harris-built smallsats launched last year. Harris’ smallsats are more high-tech than the average nanosatellite, he said. Brown estimated that Harris is probably a year or two ahead of other companies building defense-focused smallsats. Harris is positioned for sizable classified constellation work too, he said. Harris and L3 both reported improvements in their total company performances for the quarter compared to last year, with Harris counting a 9 percent revenue increase to $1.7 billion, and L3 an 8 percent increase in net sales to $2.8 billion.